theology – King James Only? As I mentioned earlier, Rev. 16:5 is one of three passages that James White (author of The King James Only Controversy) recently asked TR Only proponents to “explain why [someone] should use the TR’s [reading]“. For this verse, the TR Only claim is not unanimous. There are a few brave TR only groups that side with other TR editions against the TR edition underlying the King James Version (e.g., The Received Bible Society). Most however, defend the King James Version’s readings. I guess this verse then shows that even for TR Only folks, the King James really is the standard. Rarely will a TR onlyist admit a single error in the KJV. They will more readily admit that we have no perfect edition of the TR than that there is an error in the KJV. Okay, moving back to the point here. Let’s look at the verse itself and the reading which we are concerned about for this post. There’s a variant regarding “Lord” earlier in the verse, but the one we will focus on is “Holy One” versus “and shalt be”. Beza’s 1598 edition of the TR supports the KJV here, but several other key printed TR Greek texts have “Holy One”. The other major editions (Erasmus’, Stephanus’ and Elzevirs’) of the TR, besides Beza’s, do not contain the “and shalt be” reading. Scrivener’s 1894 TR does have the reading, but like its Oxford 1825 ed. forebear, Scrivener’s text was created based off of the English readings of the KJV and any available printed Greek texts that the KJV 1611 translators would have had. So really we’re down to Beza’s as the only TR text which includes this reading, with one exception. The 1633 Elzevir’s text, which earned the title “textus receptus“, actually sided with Beza, but the 1624 edition of Elzevir’s text and the 1641 and all following editions of Elzevir’s text go back to Stephanus/Erasmus reading of ó????. That reading is nearly equal to the reading of the Westcott-Hort, Nestle-Aland, and Robinson-Pierpont (majority) texts. The TR reading keeps the “and (??? )”, however. Geneva (1557) And I heard the Angel of the waters say, Lord, thou art iust, Which art, and Which wast: and Holy, because thou hast iudged these things. “And shall be”: The usual publication is “holy one,” which shows a division, contrary to the whole phrase which is foolish, distorting what is put forth in scripture. 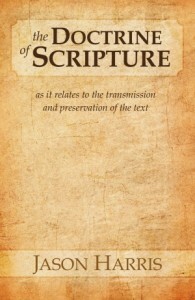 The Vulgate, however, whether it is articulately correct or not, is not proper in making the change to “holy,” since a section (of the text) has worn away the part after “and,” which would be absolutely necessary in connecting “righteous” and “holy one.” But with John there remains a completeness where the name of Jehovah (the Lord) is used, just as we have said before, 1:4; he always uses the three closely together, therefore it is certainly “and shall be,” for why would he pass over it in this place? And so without doubting the genuine writing in this ancient manuscript, I faithfully restored in the good book what was certainly there, “shall be.” So why not truthfully, with good reason, write “which is to come” as before in four other places, namely 1:4 and 8; likewise in 4:3 and 11:17, because the point is the just Christ shall come away from there and bring them into being: in this way he will in fact appear setting in judgment and exercising his just and eternal decrees. This is clearly a guess by Beza. He is looking at some Vulgate copy which is worn in the text at hand, and so based on his understanding of John’s other uses of the phrase, he concludes “shall be” is the proper reading. Now, after fixing the Vulgate reading, he then concludes he should fix the Greek reading to “which is to come”, to match the other four places in Revelation where “which are and which were” is found. The problem is, of the more than 5700 Greek manuscripts we have, and of the more than 10,000 Latin manuscripts we have, we have not a single copy supporting this reading. What’s more we have no other old language translations supporting it either. The only possible evidence for it is detailed by Thomas Holland here (that link is broken, try this one or this one and scroll down). It is a Latin commentary on Revelation compiled in 786 AD, but the commentary in question was from 380 AD. The Latin phrase “qui fuisti et futures es” is used for this passage. Beza, however, is ignorant of this support as he does not cite it as a reason for his changes to the text.